This album was notable for the return of original band keyboardist Gregg Rolie. Sound-wise, the album ploughed a bit of a similar furrow to the rocky, periodically commercial predecessor, "Zebop! ", but this one had more Latin rhythm in it, although some of the riffs are seriously heavy. I like both "Zebop!" and this one. They are both breaths of fresh air. I actually think this is a great, underrated album. 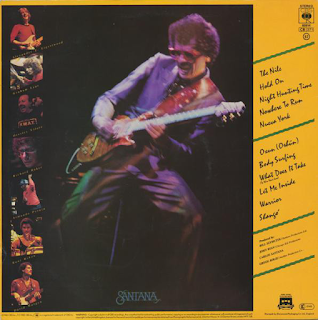 Santana's more full-on "rock" period was a good one, and a little-mentioned one, unfortunately. None of this material makes it on to "Best Of Santana" compilations, which is a shame. "The Nile" is an atmospheric, soulful groove about Egypt, with brooding rhythms and a heavy drum sound. It has some excellent heavy rock riffs too. "Hold On" is a catchy, melodic number with a Doobie Brothers vibe to it, for me. It has a very chat-friendly poppy sound as well and, indeed, was a minor hit. "Night Hunting Time" is a delicious slice of captivating funky soul. "Nowhere To Run" is a an energetic, guitar-driven rock pounder. Being the eighties, synthesiser had to make a solid appearance sooner or later and it duly does on the instrumental "Nueva York", together with some swirling organ. 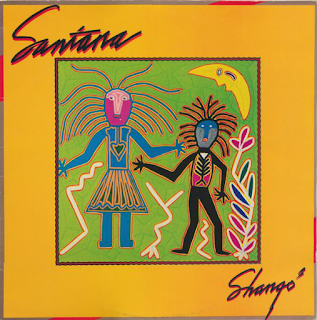 Carlos Santana's guitar flies around in typical fashion all over the track, and the percussion is, as you would expect, breathtakingly frantic. Carlos lays down some heavy riffs and the piano goes invitingly salsa. "Oxun (Oshun)" is a jerky, rock-powered song about African roots, sung in gravelly fashion by Alex Ligertwood. It contains some infectious tribal percussion and vocals in the middle before Carlos gives us some searing rock guitar. There is some addictive stuff on here. This is continued on the sublime tones of "Body Surfing" which has some lovely, melodic verses and a big, heavy, rocking chorus. It also has some quirky Latin keyboard bits in the middle. The riff sounds a bit like that used on Michael Jackson's "Beat It" in places. The cover of Junior Walker & The All-Stars' "What Does It Take (To Win Your Love)" is a good one - rhythmic and soulful, with Carlos giving us the refrain on guitar. "Let Me Inside" has a warm, bassy backing and a deep, affecting groove. Another excellent track on an album that is full of them. "Warrior" is an ebullient, muscular rocky instrumental, with a superb rumbling bass line, and the title track is a short piece of tribal, African percussion to conclude a lively, most enjoyable and highly recommended album.